I recently joined MyBlogLog and have networked with some really terrific people in the past couple of weeks. One of those contacts is a recovering attorney named Matthew Kish (I say that jokingly, of course). One of the things I like about Matt is his sense of humor. Of course, that might tell you a lot about me, but hey, in this business, affection for humor is a life-saver. Matt would probably say the same about law. 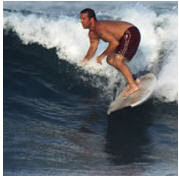 After a 10 year legal career, Matt adjusted his sails (or, in his case, surfboard) and started a company called Gringo Works, Inc., where he serves as a Management Consultant. 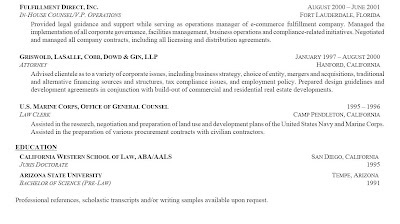 However, I think he has a real desire to pursue an in-house legal opportunity with a hi-tech company. Check out Matthew Kish if you are looking for a sharp, tech-savvy lawyer with a decade of legal experience, and a fondness for the waves. 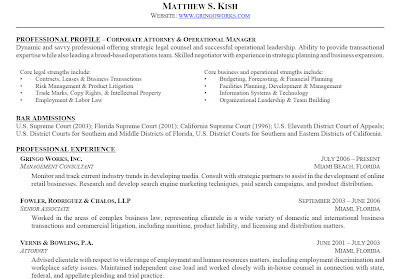 I've pasted a copy of Matt's resume below, but it's too small to make for an easy read. You can reach him via his site: GringoWorks.com. Or, send me an email and I'll put you in touch with him.